Alternative Perspectives | What do small farmers and India’s food security gain and lose from the India’s Union Budget 2016-17? The small farmer of India has been quite in the news over the last few months. The Weather Gods have conspired against them, with the evidence of 10 states declaring drought in the country. Well, how much are Weather Gods angry from the carbons emissions by the world is another story but the weather clearly betrayed the farmers and so did the state support machinery in the case of security against rising debt and crop failures. The number of farmer suicides nationwide rose to an average of 52 a day in 2015 (Sharma, 2016). There is clearly a lot that needs to be done in a sector that has more than 60 percent of the population dependent for their livelihoods and income, a sector that holds responsibility of food security for all, now and in the future. The rate of growth of this enormous agriculture sector has declined sharply from 4.2 per cent in 2013-14 to -0.2 per cent in 2014-15 (CBGA, 2016). As the India’s Union Budget 2016 focuses on rural development and increases allocations to the Ministry of Agriculture, this article looks at the case of small farmers in the agriculture sector and implications of this budget on them. The small farmers in India are not a small category in the classification of Indian agriculture (see figure 1). 85 percent of the total 138 million farmers in India are small farmers having 45 percent of the total operated land under agriculture (Ministry of Agriculture, GoI, 2013). And if the current trends continue, the small-holding nature of the agriculture is only going to increase in the coming years (see graph 1). Not just the number of farmers and the size of the land, various studies have calculated the huge share of India’s food production coming from small farmers. A 2002 report by FAO states 41 percent as the contribution by small farmers in the total food production (FAO, 2002). Another study by IGIDR in 2012 estimates 51.2 percent of the total food production coming from small farmers (Dev, 2012). There are no government estimates available on the amount of food production from different categories of farmers. These two studies have calculated using land productivities of different farm size with available census data on area under different social categories of farmers. Small holding character in Indian agriculture is a significant phenomenon both with respect to the total farmers involved and the amount of food produced in the country. Farmers in India, especially small farmers have limited access to financial credit. Average monthly savings of marginal and small farmers is (–) INR 1500 and INR 469 respectively, their average investment in productive assets ranges from INR 422 to INR 540 (NSSO). Farmers need much more capital than they can afford to save and small and marginal farmers with meager savings require a higher input of capital. The average loan amount outstanding for a farm household in India today is INR 47,000, which is an extremely heavy burden (Shrinivasan, 2015). Climate change is expected to reduce the total crop production and regional water availability for food production due to rising temperatures, changing precipitation patterns and increasing frequency of extreme weather events (Ranuzzi & Shrivastava, 2012). Shrinking resource base with depleting natural resources and increasing natural resource demand is going to affect the food production processes of the country. 60 per cent of the country is still rain-fed and depends on monsoons for their crop, highly vulnerable to changing weather conditions. Various studies have corroborated the lack of market linkages to the small farmers resulting in low price to the farmer produce. Government procurement policies have also been criticised. In 1970, the minimum support price (MSP) for wheat given to farmers was Rs 76 per quintal. 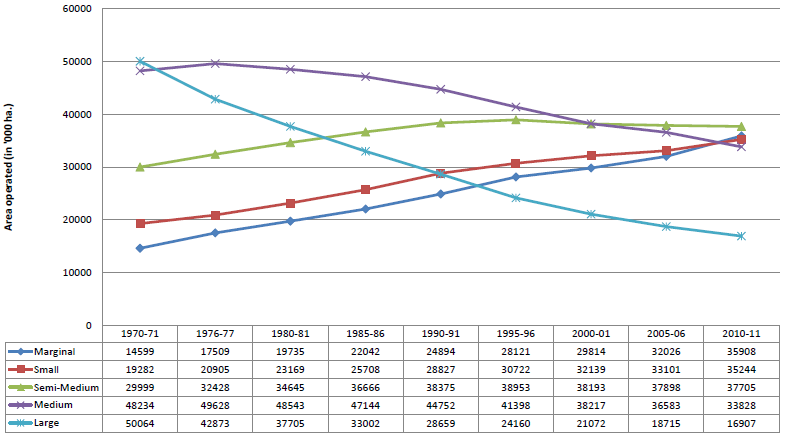 By 2015, the MSP for wheat had increased a mere 19 times, to Rs 1,450 per quintal. In the same period, the basic salary (plus dearness allowance) of government employees has increased by as much as 150 times, for college teachers and university professors by as much as 170 times, for school teachers by up to 320 times and for top corporate executives by a whopping 1,000 times (Sharma, 2016). There some critical gaps in the budget. The allocations in insurance in agriculture might only be able to address the symptoms not the root cause of the distress in agriculture sector. Further, targeted allocations in irrigation and expanding the access to agriculture credit to the last mile farmers is a critical step that needs to be emphasised in the process of utilising this budget allocations. Much needs to be done in linking the farmers to the market, value additions by supporting relevant community institutions. The relatively stagnant minimum support prices for farmers of the country also needs due revisions. The government needs to attract investments by the private sector in infrastructure development like roads, transport, and storage infrastructure in the rural sector for ensuring better agriculture gains for farmers. The government has put forth an ambitious target to double the income of farmers by 2022. Cynicism has been pointed out on whether doubling the income is spoken with respect to real or nominal incomes of the farmers. The budget has rightly set its target for achieving income security of the farmers but skepticism on the actionable part of the budget that only mentions irrigation and insurance as the vehicles of income security seems to be an incomplete plan. The Union Budget is surely a step up in the desperate conditions but is clearly not enough with respect to the quantum of the problems of the small farmers in agriculture sector and in order to achieve the target of doubling income of the farmers that it has set by 2022. CBGA. (2016). Connecting the Dots- An analysis of Union Budget 2016-17. Delhi: CBGA. Dev, S. M. (2012). Small farmers in India: Challenges and Opportunities. IGIDR. FAO. (2002). 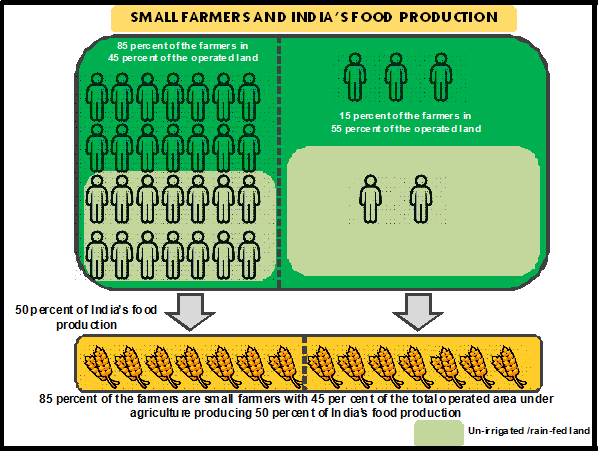 Small holder farmer in India: Food Security and Agriculture Policy. Bangkok, Thailand: FAO, Regional Office, Asia-Pacific. Ministry of Agriculture, GoI. (2013). Pocket Book on Agricultural Statistics. Government of India. Ranuzzi, A., & Shrivastava, R. (2012). 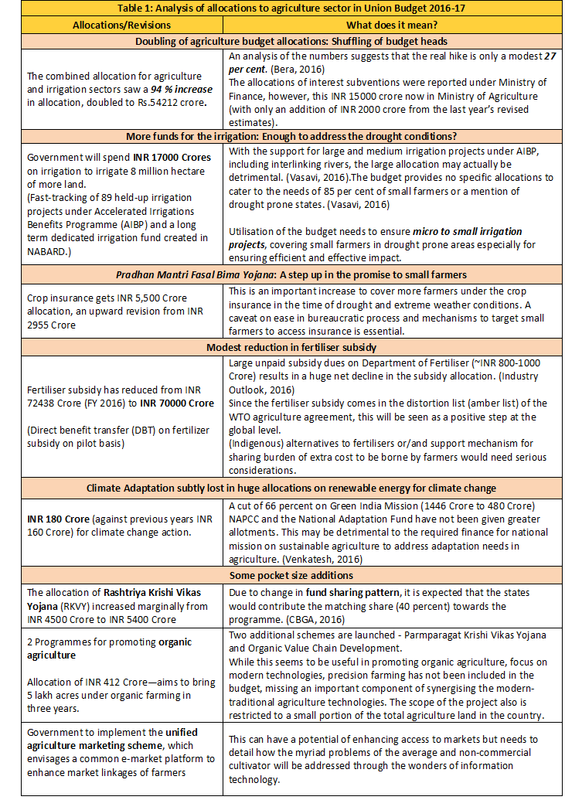 Impact of Climate Change on agriculture and food security. ICRIER.